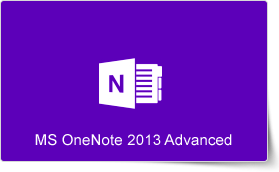 OneNote 2013 is a powerful digital notebook for capturing, storing and sharing information of various kinds. It is fully integrated with the cloud so that you can easily access your files from anywhere around the world on almost any mobile device, tablet or browser. OneNote 2013 Advanced Training Course guides you through every advanced feature of OneNote 2013 with the help of graphics and engaging teaching tools to help you gain mastery over it quickly. During this training course, participants will receive a deep knowledge of how to use each advanced feature of OneNote 2013, including reviewing the calculator capabilities, working with equations, converting Ink to Math, sorting table contents, and setting proofing language. The course is designed for easy understanding and deep retention of information. After participating in this short and highly engaging training course, participants will develop the skills to use OneNote 2013 effortlessly to conduct various functions, including syncing notes across computers and devices, saving and sharing files in the cloud, drawing or handwriting notes, collaborating, and embedding Excel spreadsheets and Visio diagrams.